How could dinosaurs possibly have been smart? Pound for pound, they were some of the dumbest creatures ever to roam the planet. However, not all raptors, tyrannosaurs, stegosaurs, and hadrosaurs were equally stupid; some may even (just barely) have attained a mammalian level of intelligence. On the following slides, you'll find a list of the 10 smartest dinosaurs, based on a combination of their anatomy and their behavior. Troodon, a human-sized theropod of the late Cretaceous period, has become the poster lizard for dinosaur intelligence, thanks to a decades-old (and somewhat whimsical) paper by the paleontologist Dale Russell speculating about how this dinosaur might have evolved if it weren't for the K/T Extinction Event. Judging by its predatory arsenal--big eyes, blazing speed, and stereo vision--Troodon must have possessed an especially big brain, "big" in this context meaning about the size of a modern opossum's (which, for its proportions relative to the rest of its body, still placed Troodon well ahead of other dinosaurs). Despite what you saw in Jurassic Park, Deinonychus wasn't nearly clever enough to turn a doorknob (yes, the "Velociraptors" in Steven Spielberg's movie were actually played by this much bigger raptor, albeit scaled up in size and shorn of their characteristic feathers). But there's convincing circumstantial evidence that Deinonychus must have hunted in packs to bring down the plant-eating dinosaur Tenontosaurus, which would entail a fairly sophisticated level of strategic thinking and communication, and hence a bigger brain. When it comes to dinosaur intelligence, it's not how big your brain is compared to other reptiles in your size class, but how big your brain is compared to the rest of your body. In this respect, the tiny, chicken-sized Compsognathus appears to have been an honor student of the late Jurassic period, perhaps as smart as a very dumb mouse (and yes, in the Mesozoic Era, that was enough to land you in the advanced-placement class). Perhaps Compsognathus evolved its level of smarts to keep up with the gliding Archaeopteryx, the fossils of which were discovered in the same German sediments. You might not think Tyrannosaurus Rex had to be particularly smart to hunt down its food—after all, this was the apex predator of late Cretaceous North America, equipped with huge teeth, powerful legs, and a keen sense of smell. But judging by an analysis of existing skulls, T. Rex had a fairly large brain by Mesozoic standards (although today this dinosaur might be outwitted by a newborn kitten). T. Rex was certainly equipped with more grey matter than the comparably sized Giganotosaurus, an unusually dim-witted predator of South America! The late Jurassic Allosaurus wasn't quite as intelligent as T. Rex, which appeared on the scene over 50 million years later (paleontologists have discovered numerous Allosaurus skeletons at a single site in Utah; the theory is that these theropods stopped to feast on some herbivorous dinosaurs trapped in the mud and stupidly wound up getting stuck themselves). 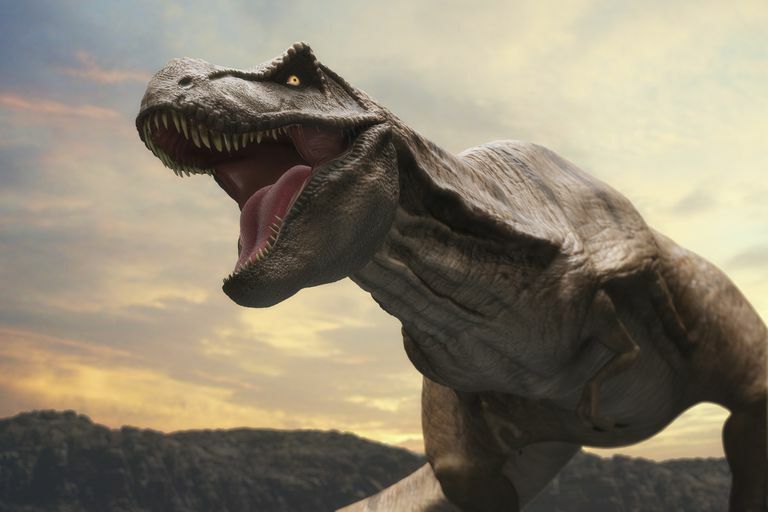 But as a rule, fast, agile theropods tend to have fairly large brains, and Allosaurus was nothing if not fast and agile, making it the apex predator of its North American environment. The only dinosaur ever to evolve the ability to sing and dance, Barney has been a fixture on public TV for over two decades, a tribute to this unspecified species' intelligence, savvy, and PR team. Based on a careful analysis of his PBS show, scientists have concluded that Barney possesses an almost human-sized brain, albeit slightly atrophied from extended exposure to adorable toddlers. It's as yet undetermined whether Barney's bestest pal, a ceratopsian bearing the unlikely name Baby Bop, also qualifies for the Advanced Placement class.